A local businessman, who grew up in his family’s hardware store, wanted to find a way to help independent hardware stores succeed in this era of consolidation and increased competition. His idea was to build an association where members could band together to share information and resources. And, he added, it had to be focused on the issues facing the California hardware industry. Aaron Hichman came to us with the concept mapped out but needed a strong brand and logo to bring it all together. Our first step was finding just the right name for the Association. 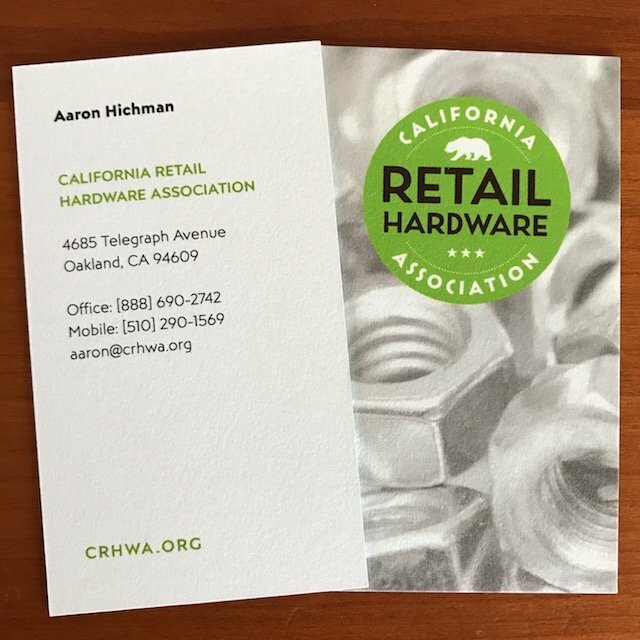 We had a laundry list of ideas that circled Aaron’s concept, but when California Retail Hardware Association hit the page, we knew it was the winner. We knew early on that we wanted some a seal to anchor the logo. We thought it would be flexible enough on a number of applications – collateral, marketing, social – and would be an interesting stamp down the road if the Association decided to approve products. We experimented with a variety of California landmarks and influences to find something that inferred the State but wasn’t clichéd. We uncovered the bear and star from the California flag, and it struck just the right balance. Likewise, we wanted a color that reflected the beauty of the State. The CRHWA Green was selected because it matched that and we felt that it would stand out in a crowd. Too many other associations rely on red, white, and blue. Our deliverables for CRHWA included the logo, a brand book, collateral materials, and a landing page website (used until their member’s website was built).